Psst. 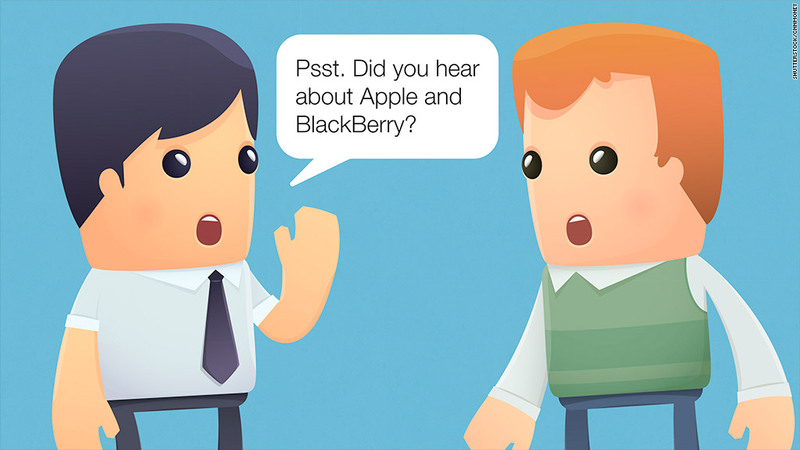 Did you hear about Apple and BlackBerry? Let's face it. We all love to gossip. Even traders. Especially traders. But instead of rumors about celebrity romances or star athletes getting traded, Wall Street chatterboxes yak about potential mergers and acquisitions. And takeover talk in the tech sector has gone into overdrive lately. Earlier this week, there were unconfirmed reports that Apple (AAPL) may want to buy BlackBerry (BBRY). The rumors lifted BlackBerry stock -- even though it's highly unlikely that Apple would purchase the company. BlackBerry does have a better reputation for security and also some patents Apple might like. But BlackBerry is still trying to turn itself around and it has been a rumored takeover target for awhile now. Both Lenovo and Samsung have been cited as potential suitors. So you have to take any new BlackBerry rumors with many grains of salt. There was also speculation that Apple could make a play for flash memory provider SanDisk (SNDK). It's not clear why Apple would want to acquire one of its suppliers though. Yelp for sale? Beyond Apple, shares of Yelp (YELP) have skyrocketed on reports that the online review site has put itself up for sale. Google (GOOG) -- which already owns Zagat -- and Yahoo (YHOO) -- which gets named as a possible buyer for almost every Internet company that's supposedly on the shopping block -- are said to be interested. But Yelp has not confirmed that it is looking for a buyer. The stock is also absurdly expensive -- trading at 100 times 2016 earnings forecasts. It's hard to imagine a buyer that wants to overpay for Yelp. Cloud software firm Salesforce.com (CRM) has popped on merger scuttlebutt too. Microsoft (MSFT) was rumored to be mulling a bid. But Salesforce is also a very pricey stock. And there's no indication that the company's founder and CEO Marc Benioff -- who recently made headlines for taking a stance against the controversial religious freedom law in Indiana -- wants to sell. Cybersecurity stock FireEye (FEYE) shot up on Wednesday following whispers that Cisco (CSCO) may want to buy it. This particular rumor is not new. And Cisco CEO John Chambers, who is set to retire later this year, shot down the talk during the company's earnings conference call Wednesday. He did not mention FireEye by name. But Chambers said that even though Cisco usually doesn't comment on takeover rumors, analysts shouldn't "bet on the one that you heard today." Finally, talk that Intel (INTC) will buy chipmaker Altera (ALTR) are still circulating -- despite the fact that Altera reportedly rejected Intel's offer last month. Big Tech has a lot of cash to burn. So will any of these rumored deals actually happen? Perhaps. Verizon's (VZ) purchase of AOL (AOL) proves that where there's smoke, there occasionally is fire. Discussions about that deal first perked up in January. Still, the fact that there are so many takeover rumors involving the titans of tech shows that investors desperately want these companies to do something productive with their gobs of cash. Apple ended last quarter with $194 billion in cash. Microsoft had more than $95 billion. Google had $65 billion. Cisco has $54 billion. Intel is the relative pauper of the group, with just $14 billion. Nearly all of these companies have used some of their cash to pay dividends and buy back stock. Google is the lone exception. But they clearly all have a lot of spare change still lying around. So you can probably expect a lot more takeover rumors. Just don't believe most of them.